Live in a highly sought-after location in downtown Saint Petersburg! The best of privacy and location are yours to enjoy in this beautifully appointed 1,863 square foot townhome for sale in Saint Petersburg. 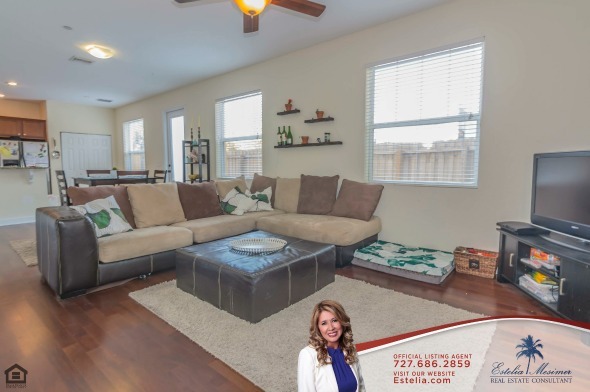 If you long to live in a conveniently located abode, this spacious 3 bedroom, 2.5 bath townhome is what you are looking for. Move-in ready, this 3 story townhome in Saint Petersburg features a modern design, an open concept floor plan with 1O foot ceilings and hardwood floors throughout the main area. Step inside a bright and welcoming living room with neutral tone walls and big windows. The gorgeous hardwood floor adds a rustic appeal and warmth to this townhome’s interior. Relaxation comes easy when you are in a light and airy environment, which this living room provides. The neutral tone walls also create a perfect canvas for the type of decor and furniture you decide to choose. On the other side of this great room is a large and modern eat-in kitchen with a cheerful ambiance. 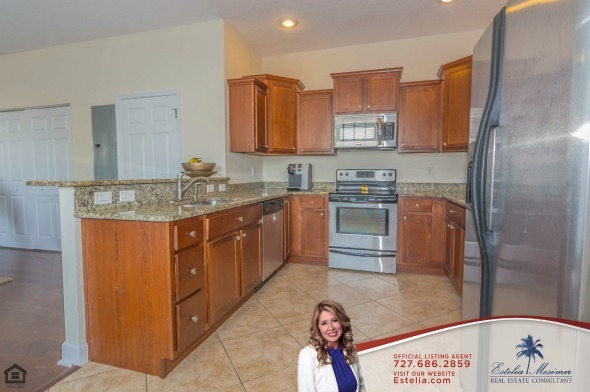 Featuring tile floors, a breakfast bar which sets the kitchen zone apart from the dining area, granite countertops, and stainless steel appliances, this kitchen is ready to prepare your delicious meal. This Saint Petersburg townhome also has plenty of cabinets for your storage needs. This townhome has 3 large and carpeted bedrooms, any of which you can convert into a master bedroom. Currently, the master suite is on the third level, which you can convert into a great room or second living area. Spacious yet cozy, this master bedroom is the perfect space to sleep, relax and unwind. The en suite bathroom has a shower and a vanity. There is also a wet bar on the third floor, a great place to keep drinks for when you have guests coming over. You also have access to a private rooftop terrace with views of the city skyline. It’s all about the views from this terrace. You will get the joy of sunrise and sunsets and watching the night comes and the city lights coming alive, all from this terrace. 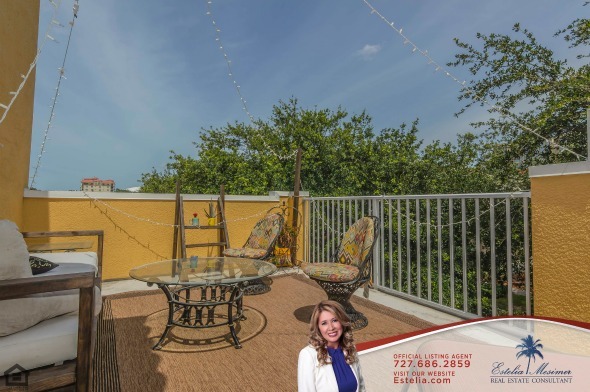 On top of all the amazing features and amenities of this Saint Petersburg townhome, it is minutes away from downtown dining and shopping, museums, waterfront parks, Bayfront Medical Center and USF St. Pete Campus. This townhome has a low, monthly maintenance fee, allows pets and best of all, allows you a downtown lifestyle at such an affordable cost. Make it yours for $424,900. 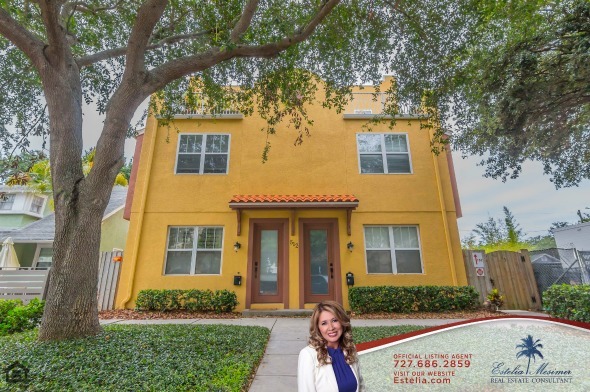 For more information about this townhome, visit my website www.Estelia.com. 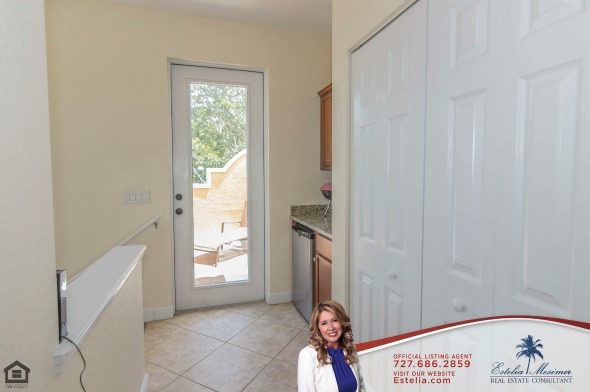 Call me, Estelia Mesimer, at (727)686-2859 today. Let me help make your real estate dream a reality.